What Is A Pull Up And Dip Station? Along with a weight bench and dumbbells a home gym is never fully complete without a pull up and dip station. 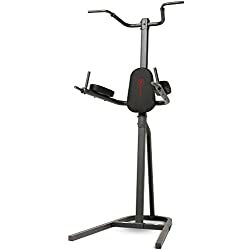 This versatile piece of equipment allows you to perform a wide range of exercises targeting all of the major muscle groups. But which is the best pull up dip station? To answer this question we have put together reviews of the top 10 models. In our reviews we have covered the best budget models all the way up to the best dip station UK customers can buy to bring you the number one model for home pull up and dip stations. 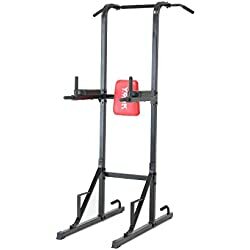 For those that aren’t 100% sure as to what a pull up and dip station is let me explain. 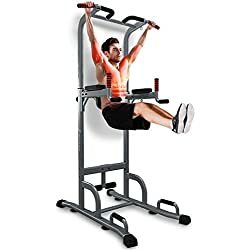 Essentially speaking a pull up and dip station is a piece of home gym equipment that allows you to do a variety of pull ups, chin ups and to perform dips. These exercises are great for building up the back muscles, biceps and triceps. 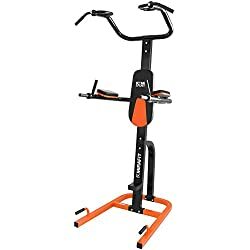 Furthermore most models offer other exercise options aside from pull ups and dips making this a very good piece of home gym equipment for workout variety. Below you can find a list of the exercises that can be performed on a power tower. 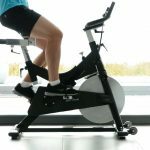 The Hardcastle brand are best known for their affordable home fitness equipment that has a degree of quality too it. 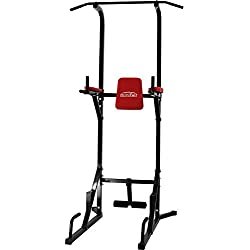 Due to this been a budget pull up station it is obviously not the best, however, it is fully functional and does the job it is supposed to do. With a maximum user weight of 90Kg this model won’t be suitable for everyone though, bear this in mind if you weigh more than 14 stone. With good customer feedback and positive reviews previous buyers seem to be happy with their purchase. if you are on a very limited budget the Hardcastle Dip Station is the best buy out of all of the very cheapest pull up and dip stations. Due to the low price the Schindora Power Tower and Dip Station is technically speaking a budget model, however, there is one feature to this model that you wont get with even the most expensive models and that is a massive 200Kg maximum user weight. With a max user weight that high you can be certain that this is a sturdy and very robust pull up and dip station. 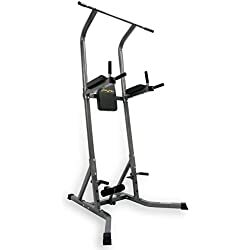 If you are bigger/heavier than most people then this is definitely one to consider as you won’t find another cheap dip station with a max user weight similar to this one. 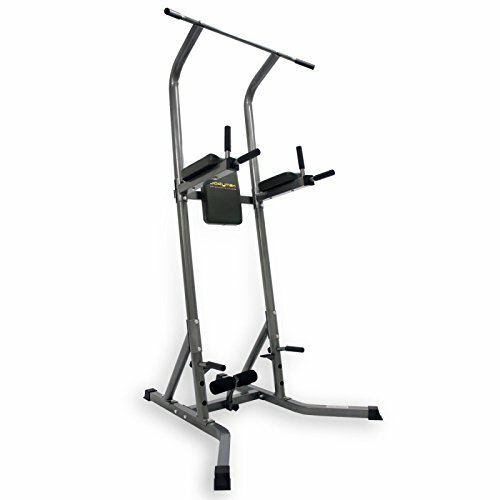 We R Sports make some very good home fitness equipment at a price that is affordable to the majority of people. The We R Sports Home Dip Station is a prime example of the brands great value for money products. 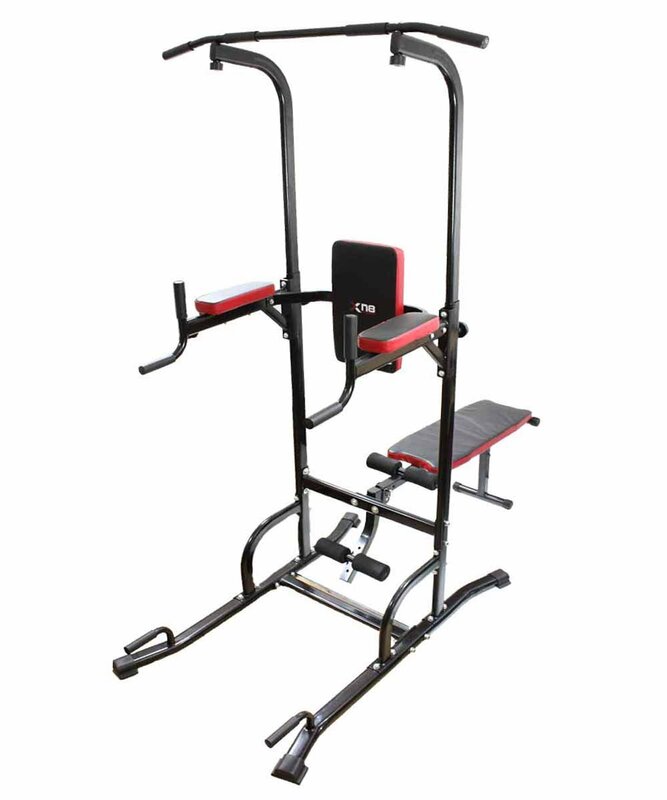 With the added bonus of a built-in adjustable weight bench this model offers versatility and a lot of exercise options. The frame is adjustable allowing the user to change the height to the desired level. Other features include leg straps on the sit up bench and push up handles. Offering great value and a varied workout at a good price this one is worth taking a look at. The only potential downside for some is the maximum user weight of 100Kg. From weight benches and dumbbells to power racks and smith machines the Marcy brand make some of the best home fitness equipment. The Marcy Eclipse CT6000 Power Tower comes with excellent customer feedback a very respectable four and a half star rating on Amazon. Been typical of the Marcy brand this is a well constructed and very solidly designed dip station. As you can see from the product image the arm rests are set different to most other models, this is due to the ergonomic design which leads to a more comfortable workout position. At the time of writing there is a massive 50% on this pull up station making it a good time to buy a top quality model for a budget model price. The Mirafit VKR multi-function gym power tower is one of the best-selling models in the UK and there are plenty of previous customer reviews to be found. Overall buyers seem to be very impressed with this one as it is said to be very sturdy for a free-standing dip station. With as much positive feedback as the Mirafit VKR has from previous buyers it’s pretty much guaranteed that this is a very good home pull up and dip station. One thing to consider when buying this power tower is that it comes in two colours, black or silver, for some reason the black one costs a bit more than the silver model. 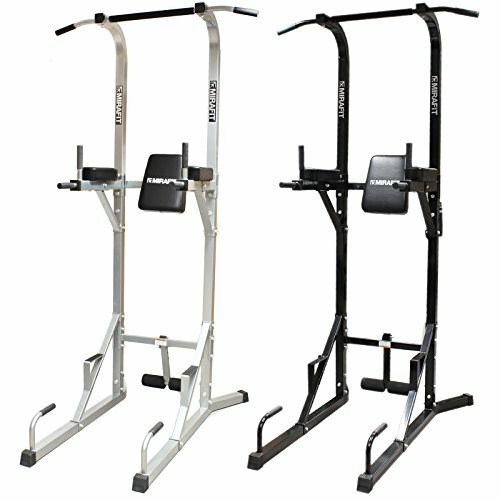 The XN8 Sports pull up and dip station is another model in our top ten reviews with the added bonus of a weight bench. 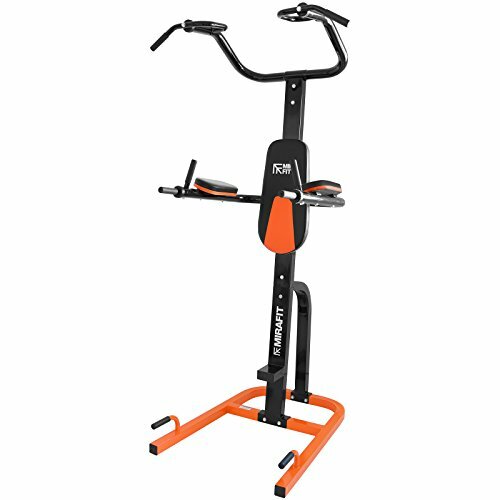 If you are looking for a power tower with a wide range of workout options then this may be the one for you. The XN8 Sports brand aren’t as big as some of the other players on the market but they have constructed a very well designed power tower with this one. The overall design is as solid as they come and assembly is said to be a simple process. With good reviews this lesser well-known brand have done good with this one. Another model by the Mirafit brand and a very bright and colourful one at that. The striking colour scheme might not be to the taste of some people, however, it makes a change from the usual dull grey and plain white models. In terms of features this model has all the usual workout options. Most noteworthy is the ergonomic design which also allows for maximum workout space. Another positive are the thick padded and lager than usual back and arm rests. Overall this is another good power tower by the Mirafit brand and a very well designed one. 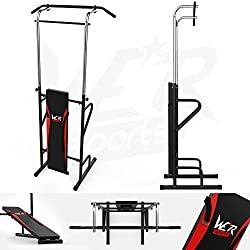 You can’t make a top 10 list of the best home gym equipment without the York Fitness brand appearing in there somewhere. York Fitness are one of the most well-known gym equipment brands and have been making fitness equipment for a long time. The York Fitness Workout Tower is a very popular pull up dip station despite it’s simplicity. When compared to other big brands this model does look similar to the cheaper dip stations that can be bought. However, previous customers speak highly of its stability and sturdiness and overall functionality. 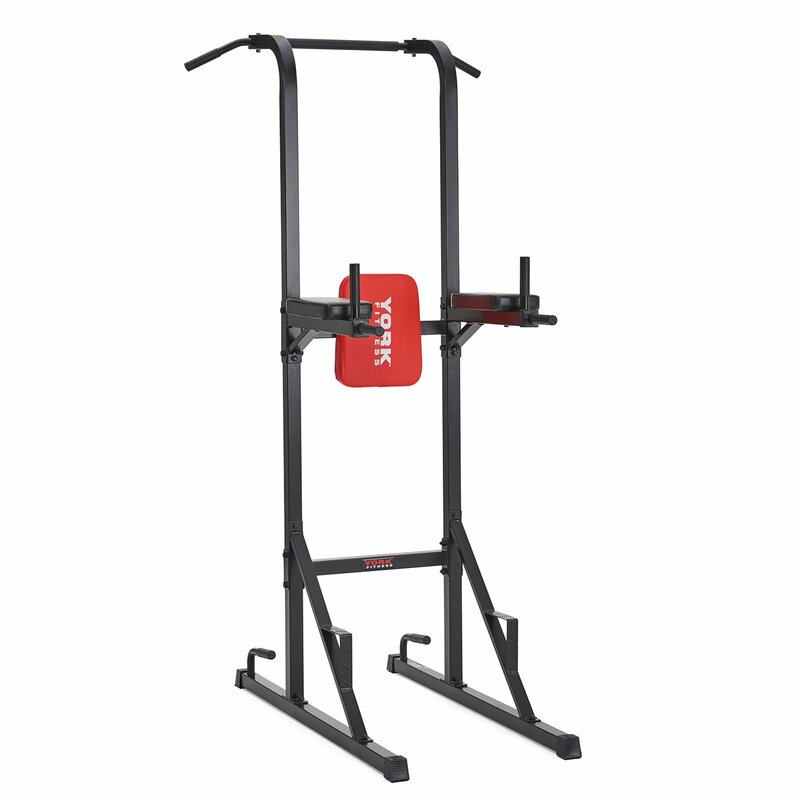 The Sportstech PT300 power tower is the latest model to hit the fitness market and it appears to be a very good contender for the best pull up station. As you can see from the product image this is a very robust looking power tower. This you may have gathered by now from our reviews is an essential requirement for when purchasing a power tower. With a wide-set design for added stability and rubber feet for grip this free-standing dip station won’t move an inch when been used. In total this model offers seven workout options not including variations. To conclude the Sportstech PT300 Power Tower is a bit pricey when compared to other models, however, with the extra price comes better quality. The Bodymax CF360 Deluxe Power Tower is the number one best-selling pull up and dip station in the UK. With numerous positive customer reviews and been Amazon’s choice model, this is without any doubt a very good multi-function power tower. 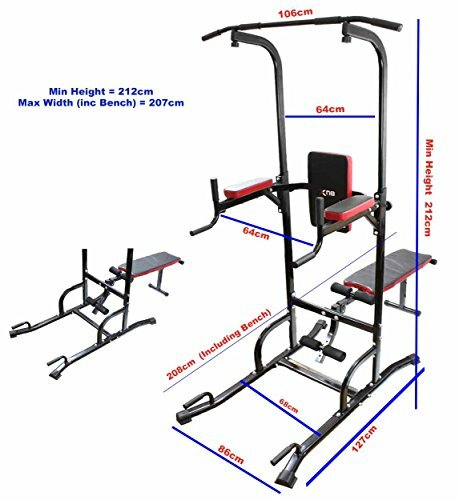 Been constructed from thick tubular steel this is a very durable and solid piece of home gym equipment. The maximum user weight of 135Kg is enough to accommodate the majority of people. With thick padded upholstery for extra comfort users wont suffer from the pain that some cheaper models inflict. If you are looking to buy what the majority of people consider the best home pull up dip station then you have to check out the Bodymax CF360. 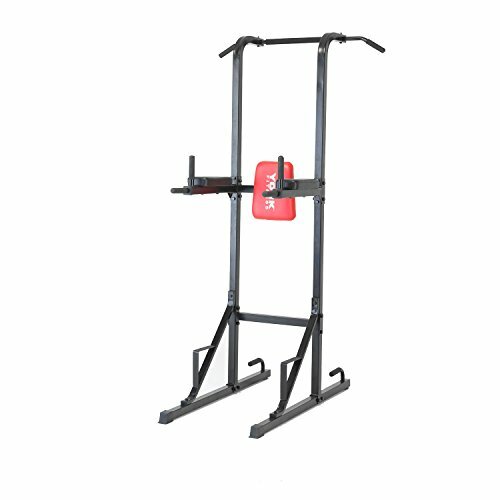 Before buying a pull up and station there are a few things to consider. If you are to get the best dip station for your needs and budget the following points are worth bearing in mind. 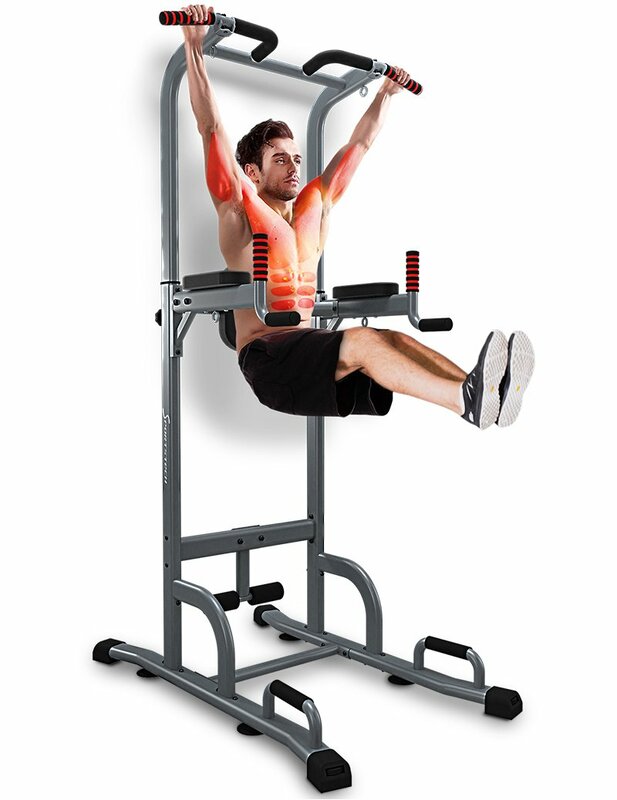 The size of a pull up and dip station is an important purchasing consideration, especially if you have limited space. Most models have dimensions in the area of 220cm(h) x 135cm(d) x 100 cm(w). Due to it only taking a minute to do it is worth measuring up to see if you can actually fit a power tower in your home gym area. In addition this will save the hassle of having to send something back. The maximum weight capacity is a very good indicator of how well-built a pull up and dip station really is. 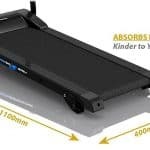 Potential buyers will find when searching through models that the cheaper ones have a maximum user weight of around 100kg, with the odd exception. Generally speaking the more expensive the higher the maximum user weight is. Generally speaking most pull up dip stations have the same amount of exercise options. 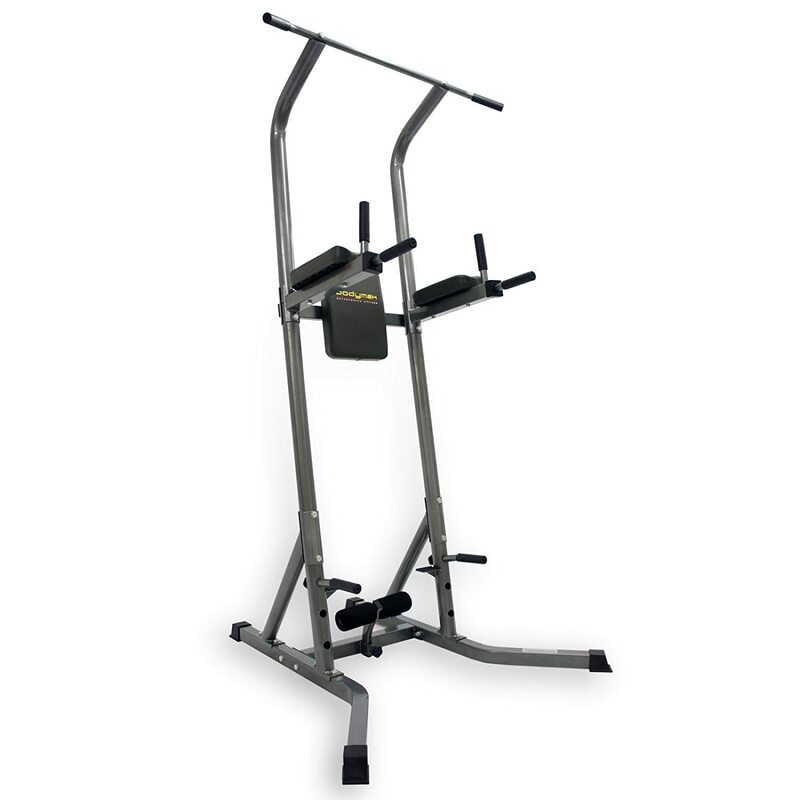 However, there are a few models that have a built-in weight bench for example. 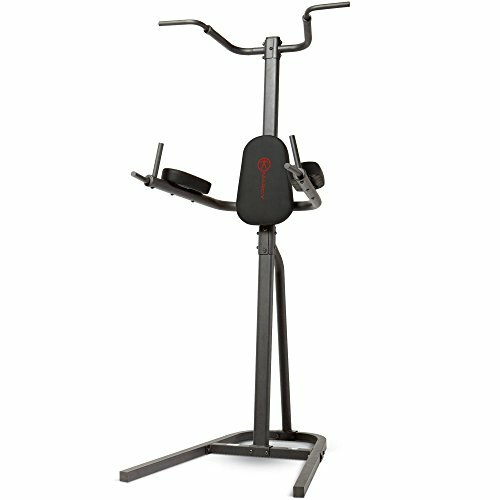 When buying a power tower try to get the model with the most workout options as this adds variety to a workout. 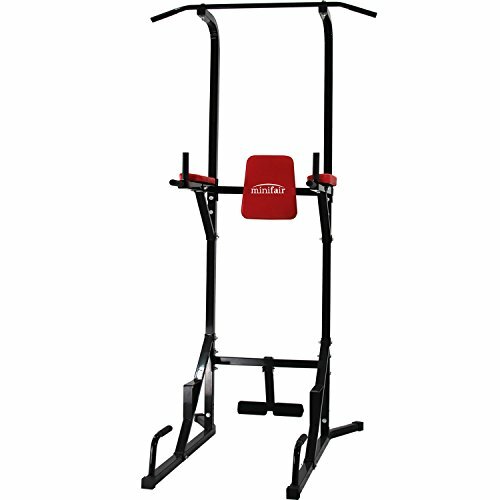 The price is the most important consideration for most people when buying a pull up and dip station. There are some very good budget models available to buy and it isn’t always necessary to buy the most expensive model to get the best one. Buying the best pull up dip station doesn’t always mean buying the most expensive one. 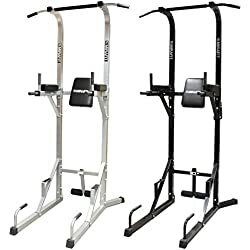 There are plenty of cheap power towers with good specifications and all the features needed for a varied home gym workout. In our top 10 list we have covered models for all budgets, so there should be something for everyone in there. 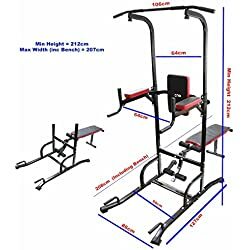 If a pull up and dip station is not for you then check out our guide on buying the best home multi gym with all the top models.